Business magazine Forbes’ annual listing of the Philippines’ 50 richest tycoons has always been dominated by men, with just handful of women present. In this infographic timed for International Women’s Day this year, we take a closer look at the women who made it to the exclusive list the American magazine released in August 2017. In the latest Philippine rich list, Forbes listed seven female tycoons, though two of them were paired with male family members. Here’s more information on them and the companies from which they derive a bulk of their wealth. 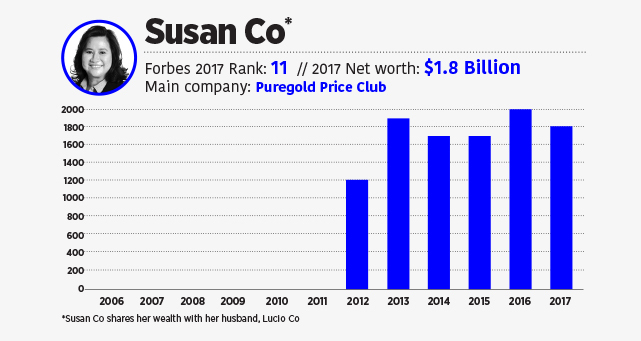 Susan Co is the vice chairman of Puregold Price Club, which operates a network of 290 branches across a variety of formats. Among these formats is bigbox supermarket concept S&R, which the company acquired in 2011. Puregold’s wide reach has helped it to grow revenues to Php87.2 billion in 2016, making it the largest among supermarket chain operators. Related story: SM, Robinsons or Puregold: Who's the Biggest Supermarket Chain of The All? Co has been listed with her husband, Puregold chairman Lucio Co, since they entered Forbes’ annual rankings in 2012. This makes them the only husband-and-wife couple to be listed together in the exclusive list, owing to both spouses’ large stakes and executive positions in their various companies. 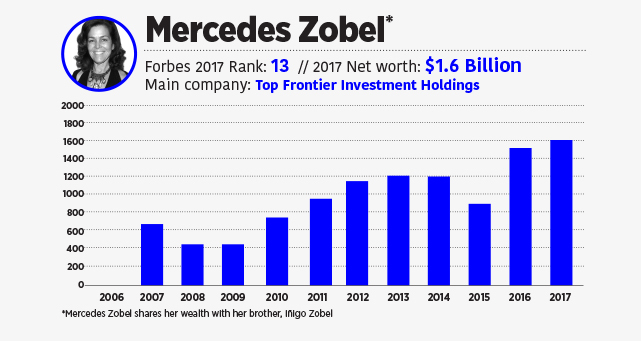 Mercedes Zobel’s family holds large stakes in two of the country’s biggest conglomerates: Top Frontier Investment Holdings (TFHI), which is the majority owner of diversified food and beverage firm San Miguel; and Ayala Corp., which was previously headed by her father, Enrique Zobel. Zobel appears in the Forbes rich list with her brother, Iñigo, who serves as the chairman of TFHI and a director of San Miguel. As well, she was recognized by Forbes in its “Heroes of Philanthropy” list in 2012, citing her annual $600,000 donation to projects in education, health and the arts. 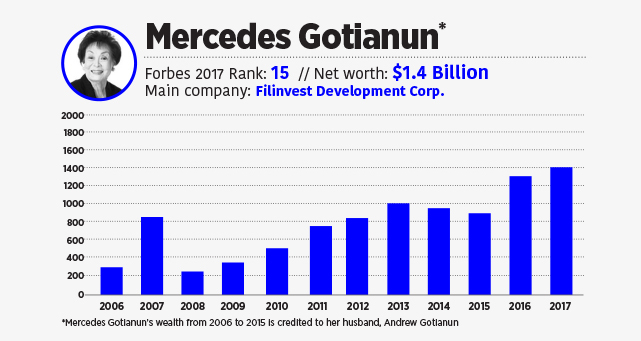 Mercedes Gotianun is the co-founder, along with her husband Andrew, of Filinvest Development Corp., which has businesses in the real estate, banking and agriculture sectors. Gotianun’s company recently made the news as being one of the seven conglomerates in a “superconsortium” that submitted a proposal aiming to expand, upgrade and rehabilitate the Ninoy Aquino International Airport. Gotianun now sits as Filinvest’s chairman emeritus after her husband passed away in 2016. According to Filinvest’s website, Gotianun was the first Filipina to become the president of a universal bank, having headed Family Bank and Trust Co. for seven years. 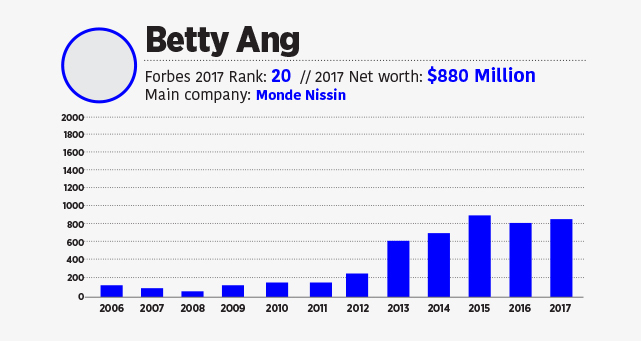 Betty Ang is the president of Monde Nissin, the food manufacturing firm behind many popular food staples in the country such as Lucky Me! instant noodles, Nissin wafers and SkyFlakes crackers. Last year, Lucky Me! was named by market analyst Kantar Worldpanel as the most chosen brand among Filipino consumers, holding the title for two consecutive years. Ang and her Indonesian husband Hoediono Kweefanus own sizeable stakes in the company. However, not much else is known about Ang beyond this—an oddity among the country’s richest tycoons. 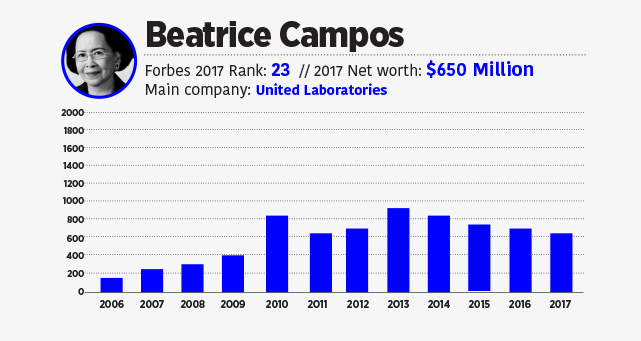 Beatrice Campos co-founded United Laboratories (Unilab), the country’s largest pharmaceutical manufacturer, with her late husband Jose back in 1945. In 2015, Unilab reported revenues of Php41.9 billion, making it the 34th largest company in the Philippines. Forbes also traces Campos’ wealth to her family’s stake in listed food and beverage manufacturer Del Monte Pacific, where her son, Joselito Campos Jr., sits as managing director and CEO. Del Monte made headlines last February when its Philippine unit announced plans to launch an initial public offering worth Php16.7 billion. Related story: Want to Own a Part of Del Monte PH, Operator of World’s Largest Pineapple Plantation, For Only Php29.88 a Share? 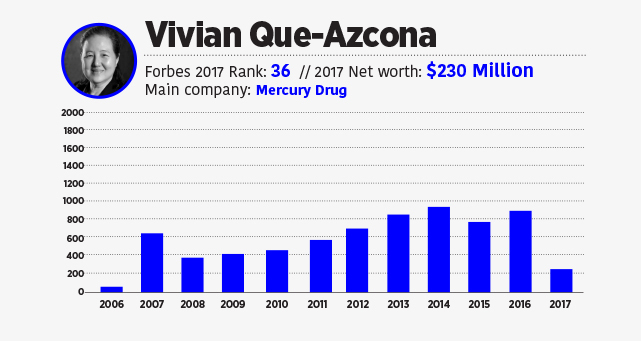 Vivian Que-Azcona is the chairman of Mercury Drug, the country’s largest drug store chain by revenue, which reached Php123.2 billion last 2016. Thanks to its over 1,100 branches nationwide, Mercury Drug is among the biggest branch networks not only in the drug stores category, but also among convenience stores. Mercury Drug was founded by Que-Azcona’s father, Mariano Que, in 1945. The company traces its roots to a small store in Bambang Street, Manila, where an entrepreneurial Que began selling affordable medicine to the then war-torn city. 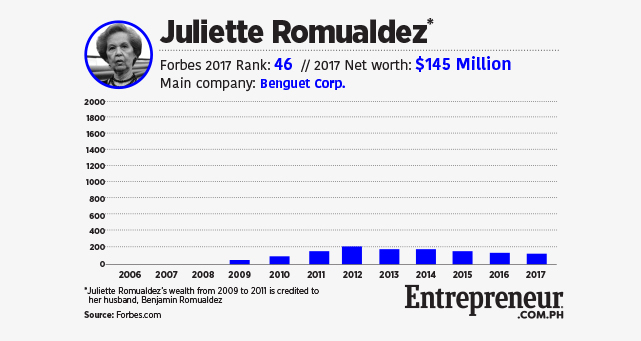 Juliette Romualdez’s family holds a minor stake in Benguet Corp., the country’s oldest mining company which was founded back in 1903. Forbes also credits Romualdez’s wealth to the sale of a minority stake in BDO Unibank, the country’s largest bank, in 2012. Romualdez’s late husband, Benjamin Romualdez, bought Benguet Corp. from its previous American owners in 1974. Today, Benguet Corp. is run by their son, Daniel Andrew, who sits as the company’s chairman. Benjamin was a younger brother of Imelda Marcos, the powerful wife of the late President Ferdinand Marcos who declared martial law and ruled by decree from 1972 until his ouster by popular revolt in 1986. Benjamin served as governor of Leyte province and ambassador to China, Saudi Arabia and the US under the Marcos regime.